When I think about family meals, I find myself being truly grateful that my parents and siblings and I always ate at the table, together. My parents would cook, we would set the table, get our drinks, and then it would just be us and our meal. There was never any radio or TV or smart phone to distract us. Sunday mornings were especially nice: my parents would sometimes cook what I would now consider to be an extravagant breakfast consisting of eggs and sausages and pancakes, etc. Or, we would stop at Dunkin Donuts on the way home from church and have a junky breakfast together. Fast forward to today. 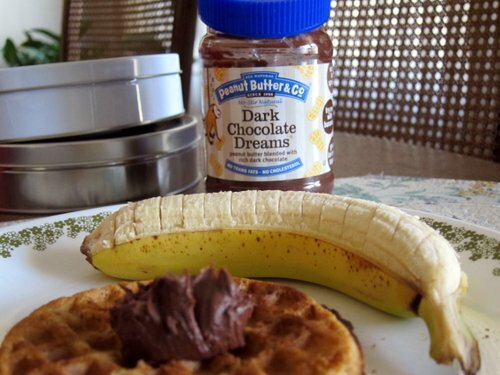 I woke up alone and wanting something comforting but healthy and easy for breakfast. This meal using items I always have in my kitchen met my criteria and was perfectly satisfying! It’s also a great meal for kids. Toast or bake the waffle according to the directions on the box. 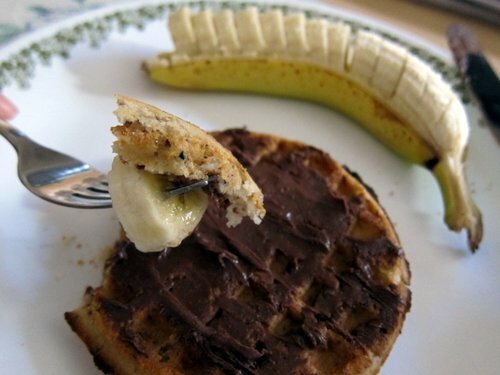 Spread the peanut butter on the waffle. Put it all on a plate.